A frame from The Matrix. 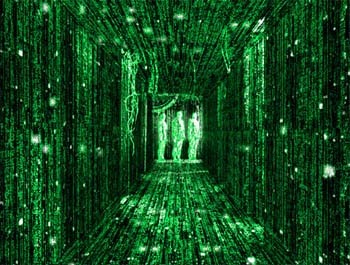 The movie popularized the idea of living in a simulated world. Are We All Just Living in a Video Game? 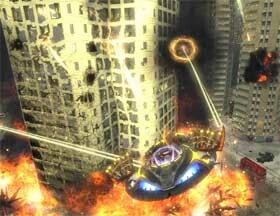 (7/08) The idea that the world around isn't real, but is actually a game-like simulation has been around for a while. It was popularized by the blockbuster 1999 movie The Matrix, and its two sequels. Certainly anybody that has played any simulation type game, from Halo 2 to The Sims has probably, briefly entertained such thoughts. It took a real genius like Nick Bostrom to suggest that such a thing just wasn't a possibility, but maybe a probability. 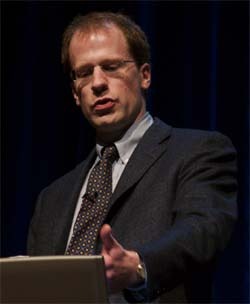 Nick Bostrom was born in Sweden in 1973. In college he studied physics, computational neuroscience, mathematical logic, and artificial intelligence. For a while he tried to be a stand-up comedian before getting his Phd from the London School of Economics. After that he worked as a British Academy Postdoctoral Research Fellow in the philosophy department. In 1998 he co-founded the World Transhumanist Association and is also currently the Director of the Future of Humanity Institute at Oxford University. So, Mr. Bostrom is admittedly a very smart guy. He also has some really way out ideas . When he first started expressing some of his thinking, people argued it wasn't real science or philosophy, but science fiction. As time has gone by, however, academia has started to accept that some of the concerns he's raising are likely to become real issues we'll need to ponder and confront. Probably one of his most talked about ideas came out of an article he wrote for Philosophical Quarterly in 2003. (You can read the original paper at http://www.simulation-argument.com/simulation.html). The article was picked up by many popular newscasts and interview shows where his views were a bit misinterpreted as "Here's a guy that thinks there is a twenty percent chance that we are living in a computer simulation." Mr. Bostrom's views are a little more complicated and nuanced than that, however, and I think it is worth my trying to lay out his ideas in simple terms while still trying to do justice to his argument. Let me start by saying that we're not talking about something like Second Life (http://secondlife.com/) where all the members are aware of their participation in a virtual world. Bostrom's ideas suggest that our entire universe might be a simulation run by some future superhuman society and we haven't a clue. Let's first start by saying that Bostrom is a supporter of trying to bring about a post-human world. Now this sounds terrible - as if he is an evil genius planning the demise of man in favor of some superhuman race. In a sense that is what he is talking about; however, you need to think about this as the next step in human evolution that we all will be taking, not just a privileged few. It's not human evolution based on natural selection, but instead we are evolving ourselves by using our technology to increase our lifespan, health and intelligence. Much of this is already underway with new drugs, medical procedures, etc. However, in the long run for Bostrum it includes such exotic items as augmenting our brains with electronic implants to increase intelligence or even uploading our minds into a computer. He argues that a post-human society will have the tremendous computing capacity needed to do these feats. While Bostrom and the members of Transhumanist Association would like to see this shift to post-human society happen sooner rather than later, in his thinking it will inevitably happen at some point in our future if we do not accidentally destroy ourselves along the way. Bostrom argues that eventually post-humans will have computing capacity enough to simulate an entire universe down to the level of neurons in the human mind. Interestingly enough, critics of Bostrom's arguments usually admit that this part of his analysis is the most solid: Given enough time, there will eventually be enough computational power to do this. The humans in such a simulation would be conscious and unaware that they were not real humans, but human emulations in a giant computer. From the way Bostrom sees it there are three alternatives possible in the future. One - humans will go extinct before they can transition to post-human society. Two - a post-human society will not have an interest in running simulations of their ancestors. Three - we are almost certainly living in a computer simulation. The first unpleasant alternative is perhaps a lot more likely than it seems. Some scientists have pegged the possibility of us making it to the end of this century without going extinct as only 50%. Bostrom himself thinks there is probably at least a 20% chance that we will do ourselves in through the misuse of our own technology. (He finds nanotechnology of particular concern. A madman or terrorist group getting hold of nanotechnology and creating self-reproducing micro machines designed to kill all life is a particularly scary vision). The second possibility if we do survive is that post-humans will have the computing power to run ancestor simulations, but not the will. Perhaps post-humans will find other ways to entertain themselves or do research. Perhaps they will find it ethically problematic to create conscious beings in a simulation. Perhaps they will run such simulations, but only a handful. If neither of the above two possibilities are true, however, Bostrom concludes that we are most likely one of the simulated societies. Why? If post-humans run such simulations in large numbers the ratio of real to virtual universes would be very high. For example, if one human society produced a post-human society that then ran a million simulations, the ratio of simulated universes to real universes would be a million to one. Then what are the chances of our world being in the real universe as opposed to the simulation? A million to one. Because there are three possibilities and it is hard to say what the probability is of any one of them Mr. Bostrom (going with his gut) gives the last alternative a twenty percent chance of being true. Hopefully if we are living in a video game it isn't Destroy All Humans II. Bostrom's Simulation Argument has its critics, of course. They cite a number of problems his theory, but the most persuasive I think is something Bostrom freely admits: The twenty percent is just a gut feeling. Of the three possibilities in the argument it may be that there is a fifty percent chance we destroy ourselves and a forty-nine percent chance that post-humans will choose not to run ancestor simulations, leaving only a one-percent chance that they will and we might be one of their creations. Of course the idea that we will destroy ourselves isn't very attractive either, so let's hope things don't go that way. Let's look at the other possibility - Post humans don't run these simulations. The general argument is that post-humans will be fascinated by their past and will try and explore it through simulations. Indeed, simulation games in our current society are very popular. The Sims, the Civilization series, Grand Theft Auto, and SimEarth are just a few of the hundreds of titles you can buy. If post-human society is capable of providing post-humans with the equivalent of desktop computers that can simulate the entire universe, how many post-humans could resist playing god? Even if a post-human wanted to run ancestor simulations, though, he might not need conscious entities to do it. It might be possible to build an accurate human emulation without consciousness (as if we know what consciousness is anyway). So we don't really have a grip on what the chances are that post-humans will run simulations with conscious beings. Without that the Bostrum twenty percent guess is just that. Can we ever directly tell if we are living in a simulated world? Bostrum thinks not and argues it would well be within the capability of the simulator's creators to hide this from us. It occurs to me that if you really take Bostrum's ideas seriously, it might well be worth trying to find evidence of his ideas looking at the structure of the universe. I admit that Bostrum's right, those creating the simulation could hide the mechanism of the simulation from us, but suppose they didn't bother? 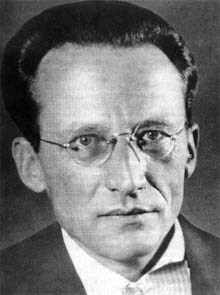 Erwin Schr�dinger in 1927 - Don't loan him your cat. I was a software engineer for a number of years and have studied the techniques used in writing simulation programs. One of the rules about such programs is that the more detail you can put into a simulated world, the more accurate the simulation. The more detail, however, the more computer power that will be needed to run the simulation. Some of our most seriously detailed simulations that we use today, like predicting what will happen when an atomic bomb is set off, requires the world's biggest, fastest computers. One trick programmers use to reduce the workload in a simulation is to avoid doing calculations for things that are not observed or do not matter to the outcome of the simulation. This sounds suspiciously to me like the idea of wave collapse in the Copenhagen interpretation of quantum physics. According to this interpretation, an atom, molecule or photon (or really almost anything) is a probability wave until it is observed and until that point can exist in multiple different states and locations. This strange feature of quantum physics has bothered physicists and philosophers for years. It doesn't make sense. For example, take the thought experiment proposed by physicist Erwin Schr�dinger involving a cat placed into a sealed box and hooked to a device that will release poison gas based on some random quantum event (like the decay of radioactive material). Some quantum theories seem to suggest that until somebody (or something) looks inside the box to see if the cat is dead or alive, the cat will be both - a mixture of states only resolved by observation. Is it possible that this quirk in reality is just a trick used by some post-human programmer to save processing time on the computer that runs the simulation of our universe? Maybe there is no need to use the processor time to simulate whether the cat is dead or alive until somebody looks at it. Well, I'd better stop here before I'm accused of quantum mysticism. This is deeper philosophical water than I care to swim in, but perhaps this thought would be worth pondering by people who understand quantum theory better than I. Even if we are in a simulation, the best methods of predicting what will happen next are still the familiar ones - extrapolation of past trends, scientific modelling and common sense. To a first approximation, if you thought you were in a simulation, you should get on with your life in much the same way as if you were convinced that you were leading a non-simulated life at the "bottom" level of reality. Bostrom is right. The knowledge that we are emulated humans wouldn't really change anything. We should continue doing the best we can do in this world. Being a simulant doesn't change the golden rule or mean that we shouldn't be compassionate and caring to others. If someday we finally do reach a post-human state of technology that would allow us to create simulations of the universe which include fully conscious human emulations, should we do so? Will we do so? I don't know if we will, but if we choose to, according to Bostrom's argument, it almost automatically means that we are simulated human emulations ourselves. Well, one final thought. Hopefully if we are being simulated the post-human in charge of our universe is playing something gentle like The Sims: Vacation, not Destroy All Humans II. 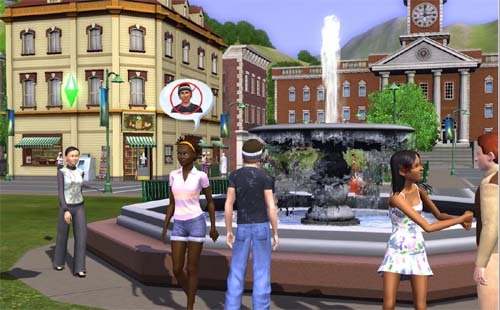 A screen shot from The Sims 3. Is this what our world looks like to some post-human race?